When the document was distributed on Dec. 19, 1956, the bus boycott had been going on for nearly 12 months. The MIA, headed by Martin Luther King, Jr., coordinated the boycott throughout. As what had initially been a short-term campaign of a few days stretched into weeks and months, the MIA organized carpools and weathered bombings and legal challenges. African-American citizens walked miles to work, and marched in protest. In June 1956, a federal district court ruled bus segregation unconstitutional; the Supreme Court affirmed the ruling in November 1956. The MIA waited until December to declare an end to the boycott, wanting to make sure that the ruling would be carried out in Montgomery. Dr. King signaled the official end of the boycott by boarding an integrated bus on Dec. 21, 1956. Gandhi-inspired civil rights leaders Glenn E. Smiley and Bayard Rustin advised King and the MIA during the boycott. This document shows how far the philosophy of non-violence had permeated the movement by the time of this victory. 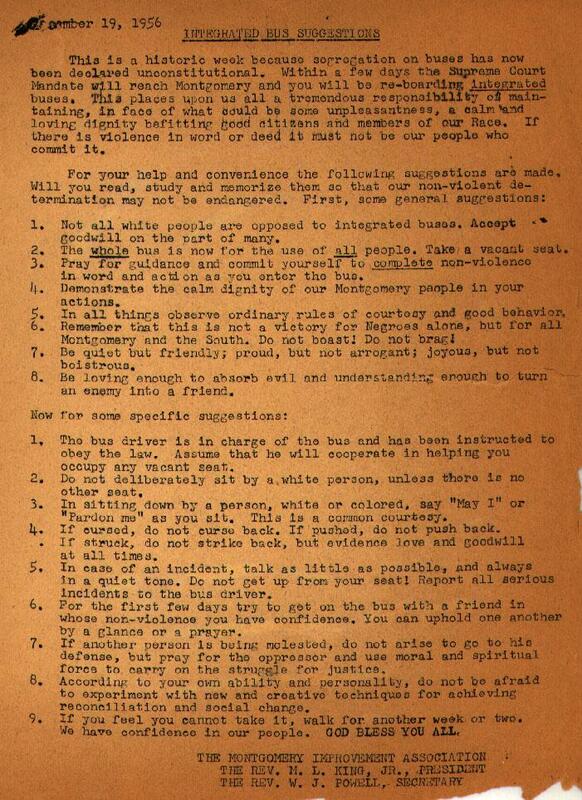 Protestors riding newly integrated busses were told to ride with an ally (“Try to get on the bus with a friend in whose non-violence you have confidence”) and to avoid conflict at all junctures (“Do not deliberately sit by a white person, unless there is no other seat”; “If cursed, do not curse back”). Thanks to Nell Minow for pointing me to this document.